This weeks challege over at Muse is a beautiful card by Vicki Dutcher and whenever I saw it,this idea popped into my head. All the round doileys just called out to me as too did the colours and the vellum hee he.... and so I got out my Uniko round in circles set and first stamped a couple of concentric (is that the right word??) circles in black then stamped the gold stripey ones in versamark and heat embossed them and then did the same with the sentiment ,Vicki's sentment seem to be one of gratitude so stuck with that idea too.I'm fairly new to using vellum but loved the look of it,except for getting it to stick down without it gaping!Finally added some black and gold sequins.But on the cardbase it didn't pop out at you as much as I hoped so added an edging of black and went with it down just two sides(but maybe should have made it slightly thinner now that I see it...) to keep it in line with the graphic look of the card. Really enjoyed making this and so thanks Vicki for getting me to try something new. Off now to have a peek at what the others have done! I love your clean & crisp take on vicki's card...absolutely lovely. 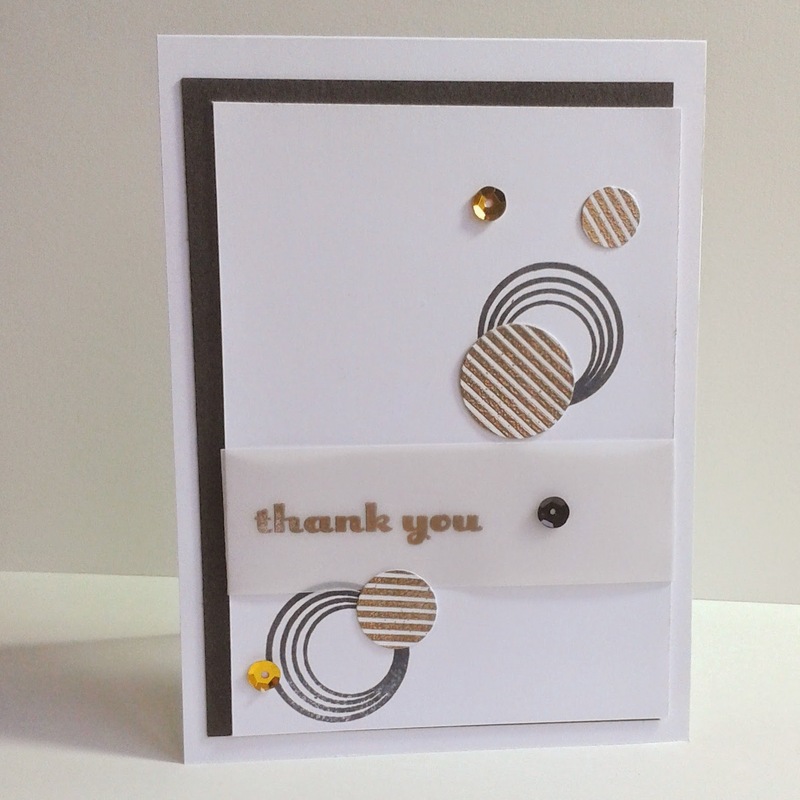 Hi Jenni - yes, sequins are just perfect for this challenge and your card proofs it! I like those graduated circles - perfect CAS card! Love the 'opposite' take on this week's Muse - very clean, graphic (and you know I love that!) So glad you joined us at Muse this week! I love your graphic take on Vicki's inspiration! Fabulous card! Fabulous card. Love the bold, graphic design. great take on the musecard!